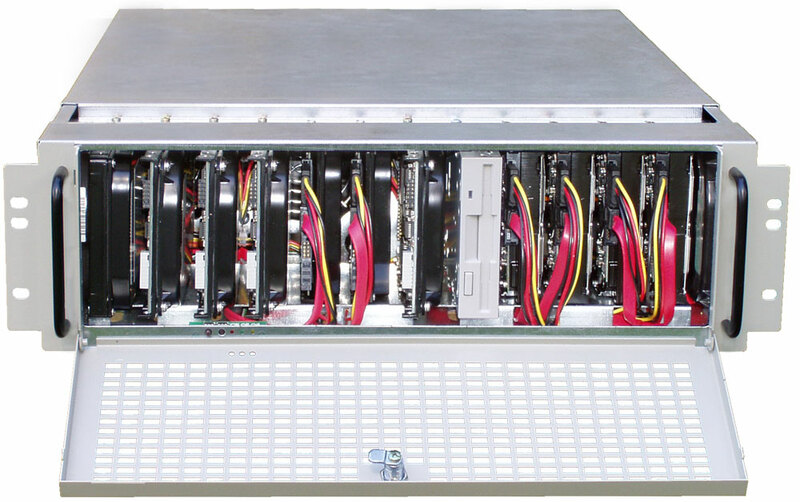 To make it possible to put 14 HDD in front line (two - on the side panels and 12 - between the top and the buttom), installing holes are not symmetric across the chassis taking into account to fasten them by directing top of HDD to the right side, look at the photo. 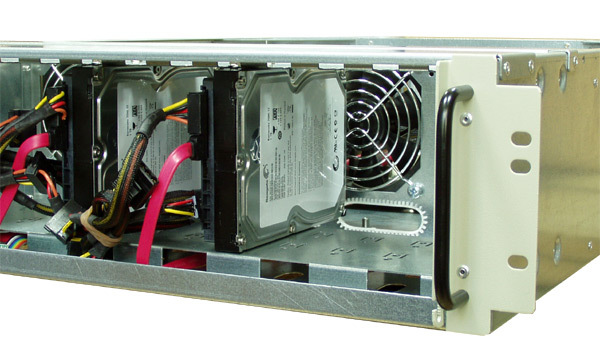 Such HDD installation even allows hot swaping of HDD (it is suppored by SATA standard) since you can easy unplug cabels only after opening the front door. The only thing you need is the access from the top and the buttom to change the disk. 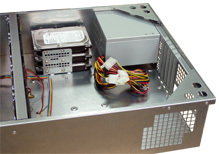 if you want to install more than 15 HDD in the chassis. 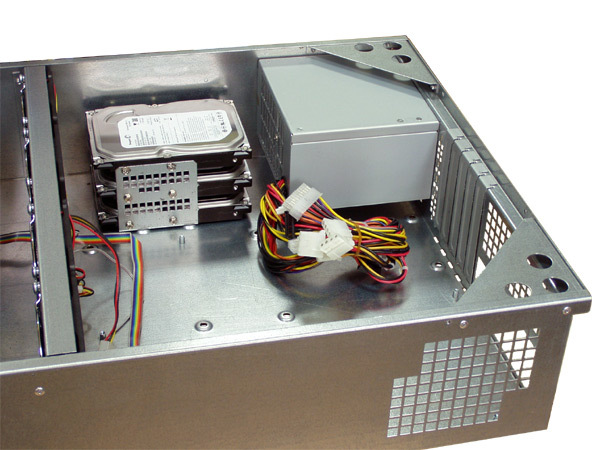 You can fasten the cage on the bottom of chassis in front of the PSU instead of HDD alone. So you can place up to 17 HDD in the chassis (14 HDD - on the front side and the cage 3HD32 with three HDD - on the buttom in front of the PSU). 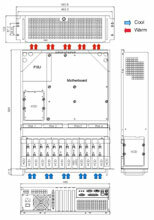 The cage 2HD26 or 3HD32 is supplied as option. It is advisable to order cage together with chassis. 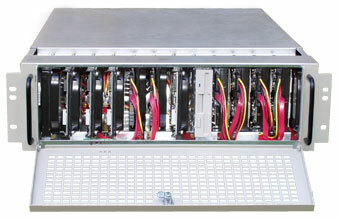 The DR-3U-500 Slide Rail Kit is supplied together with the DL36 chassis. Remove the DL36 chassis from the packaging box and check that the Kit is included. The Kit consists of two symmetric Holders - left and right. Each Holder consists of two parts - Front Bracket (1) and Back Bracket (2). Slide together the front to back sections of the Holders as shown on the picture on the left. Extend the Holders to the length required to fit the rack or cabinet before you install it. 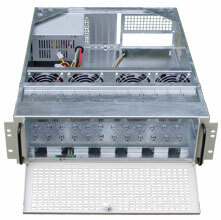 The DR-3U-500 Kit supports rack fixing distance on depth L from 400mm to 638mm. Notify, there are two variants to join Back Bracket (A and B). Screw on appropriate nuts (3) (supplied with the Kit) to each bracket, and tighten the front and the back sections. Install 12 cage nuts in the rack (not supplied with the Kit). Reffer to the picture on the left. You should install 6 cage nuts (red marked) and tighten the both Holders with 4 appropriate screws for EACH SIDE of the rack (left and right, front and back). You need to tighten 8 screws total. 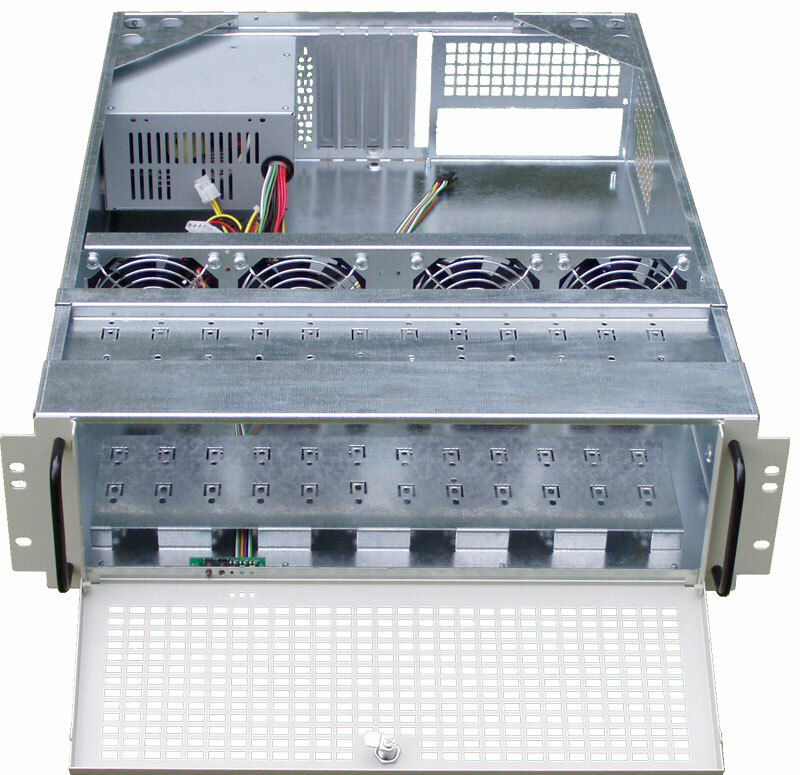 Slide the DL36 based system along the pre-installed Holders in the suitable rack. Tighten the other 4 screws on the opposite side of the front panel where it attaches to the rack.